Carlos Cordeiro, vice president of U.S. soccer, watches warmups from the team bench ahead of the start of the U.S.'s final World Cup qualifying match against Trinidad and Tobago at Ato Boldon Stadium in Couva, Trinidad, Tuesday, Oct. 10, 2017. 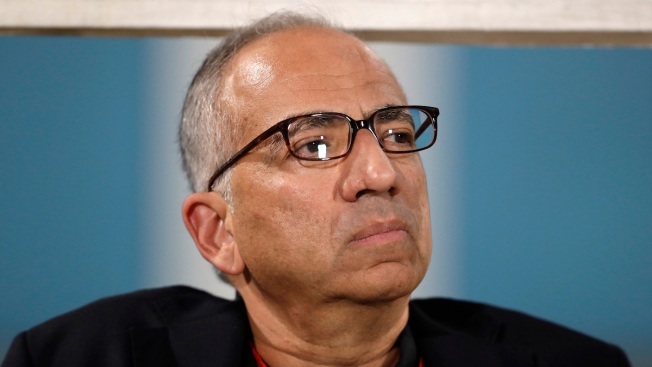 U.S. Soccer Federation President Carlos Cordeiro said the governing body was surprised when women's national team players sued alleging gender discrimination. Cordeiro said in a statement Friday the USSF is reviewing the suit filed a week ago. He spoke with some of the players this week and said he hopes for continued conversation. He stressed the federation "believes that all female athletes deserve fair and equitable pay, and we strive to meet this core value at all times." The USSF and the team agreed in April 2017 to a collective bargaining agreement through 2021 that gave the players higher pay and better benefits. Cordeiro maintains the players had not expressed concerns with the labor contract since, something the players dispute. "Our mutual goal is a dialogue that will serve the best interests of the USWNT and U.S. Soccer, so that our collective focus is where it should be — winning the 2019 FIFA Women's World Cup at a time when our team and soccer in the U.S. has so much to gain and celebrate," he wrote in the open letter addressing the lawsuit. The 28 members of the current women's player pool filed the lawsuit March 8 in U.S. District Court in Los Angeles under the Equal Pay Act and Title VII of the Civil Rights Act, alleging "institutionalized gender discrimination" that includes unequal pay with their counterparts on the men's national team. The USSF answer is due by April 2. The players collectively released a statement following the release of Cordeiro's open letter. "We are disappointed that USSF is not being truthful about multiple attempts by the players and their representatives to discuss and address discrimination and unequal pay and treatment following the 2017 CBA. Even as we train to represent the U.S. in the upcoming World Cup, we look forward to pursuing these claims and continue to hope for an outcome where USSF complies with Title VII of the Civil Rights Act and the Equal Pay Act," the players said. The U.S. women are the defending champions of the World Cup, to be played in France from June 7 to July 7. The men's and women's U.S. national teams have separate collective bargaining agreements, and their pay is structured differently. But the lawsuit cited several instances of alleged inequity. It claims the federation gave the men's roster a performance bonus of $5,375,000 after the team reached the round of 16 at the 2014 World Cup. The women's team received a collective bonus of $1.72 million after winning its 2015 World Cup. Additionally, the suit said when the U.S. men made the World Cup field for Brazil, players selected to the roster received a $55,000 bonus, while the women received $15,000 each for making the 2015 World Cup roster. Additionally, it said the men shared a $2 million bonus for qualifying, while the women shared $300,000. The USSF has maintained that any disparity is the result of separate collective bargaining agreements. Compensation for the women includes a guaranteed salary and also salaries paid by the USSF for their time with clubs in the National Women's Soccer League. The men get paid based on roster selection for appearances for exhibitions and tournaments. The lawsuit escalates a complaint that five members of the women's team filed in 2016 with the federal Equal Employment Opportunity Commission alleging wage discrimination by the federation. The lawsuit effectively ends that EEOC complaint, brought by Alex Morgan, Rapinoe, Becky Sauerbrunn, Carli Lloyd and former goalkeeper Hope Solo. In his statement Friday, Cordeiro stressed that in recent years the federation has increased its investment in the women's national team. He pointed to additional staff, chartered flights for travel and the creation of two women's tournaments on U.S. soil, as well as youth development programs. "I want to assure everyone in our soccer family that U.S. Soccer and its women's national team players remain partners with shared goals and aspirations," Cordeiro's letter said. "For that reason, we are very optimistic as to what is possible, and our commitment to reaching a common ground is absolute."